I thought it would be worth sharing a few more of the photos we took at the Dallas Market. The experts making the displays are trying to attract buyers, of course, but also showing how these decorative items can be used in your home. 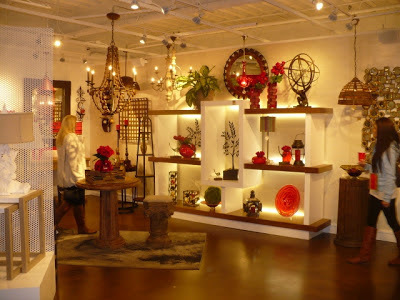 The above photo is featuring red as the main color mixed with the natural, more rustic wood pieces. Red never goes out of style, so mix it up and enjoy those bright pops of red. Purple was strong, again, and in this photo, you can see it in several applications. From rugs and pillows, to vases and chairs, look around and see where you can add some purple. This chevron pattern was noticed over and over, and we are seeing it in our fabrics lately, and I suspect it'll show up in the Spring collections, too. This bright yellow and white pattern makes a great background for these shelves and might be a great idea to spruce up the back of your shelving. Fabric or wallpaper adhered to foam core board would be an easy way to add one of the new geometric designs to your home. You may have heard by now that Emerald Green is the Pantone color of the year. What does that mean to you and me----it will be easier to find this color in fabrics and other home decor for the next year or so! You don't have to be trendy, but if you like green or want to bring more of it into your home, you probably won't have to hunt for it! I liked the display above featuring one large item in the emerald green, but also that it just takes one item to make a statement. Hang onto your gold and brass! I know, polished nickel and brushed nickel has been popular the last few years, but the gold and brass looks great with these yellow pieces, and who would have thought about using a grey/white background. 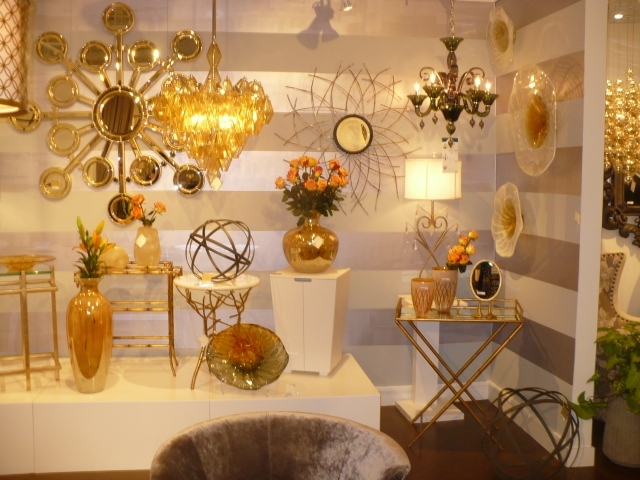 While we love yellow and grey, the use of the gold with the softer background looks great. 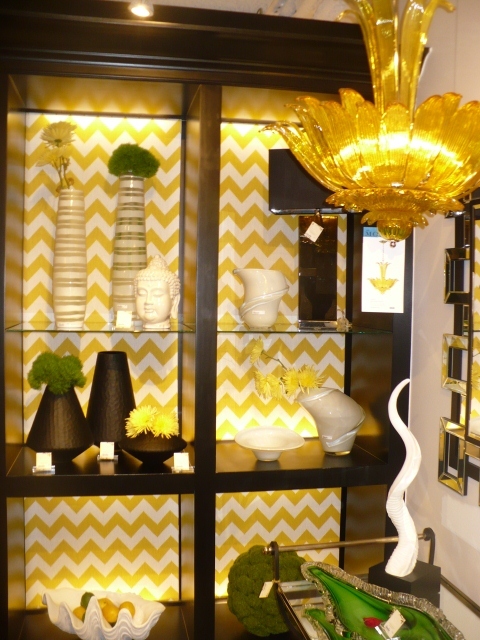 Another thing we noticed in some of the showrooms was the use of horizontal painted stripes. It's really a fresh look and wouldn't be too costly----if you have the patience to do it! 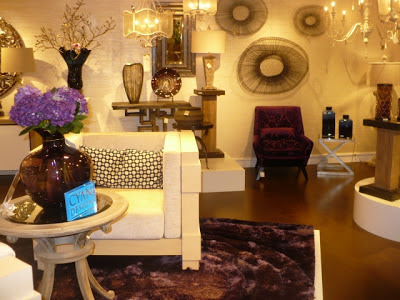 Don't be afraid to bring out those bright colors and mix them into your room in a new way. 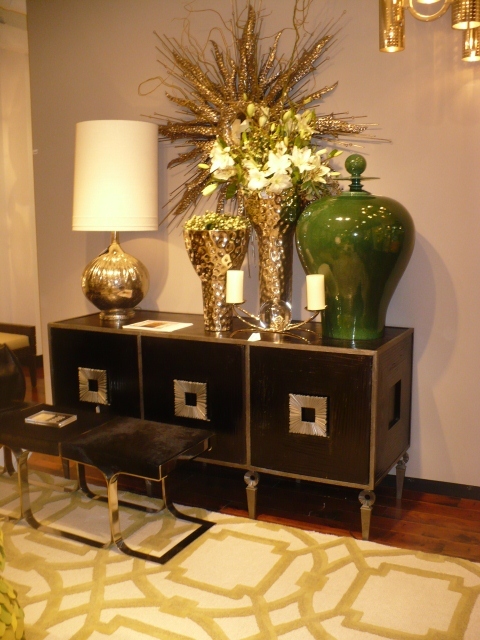 If you don't have your favorite color hidden away somewhere, come by the shop, we'll have just the right piece to add a fresh look to your home. A-ha!!! "Red never goes out of style" and "Brass is coming back". Music to my ears!! Of course I have been using red with a dab of dark sagey green and various colors of yellow and gold for......oh..........50 years or so... I am thankful to be right in style! I thought of you girls the other day when I burned my Bob's Flower Garden (??) candle. It has a lovely scent! I'm glad to know that all is going well with you. Your trip to Hickory Furniture sounded quite interesting. I am a firm King Hickory fan, but the Hickory Furniture is so lovely (just somewhat out of the reach of my pocketbook :^). Hugs to you, and happy summer! !